CraftyCarolineCreates: Craft Room Tour and Punches Update! Firstly - I have some good news for you! The selected punches which were unavailable when the new catalogue launched are now in stock! You can order them now!! I quite regularly get asked to give a tour of my craft room. I've always been a little reluctant to do this as my space isn't huge and the majority of craft room spaces I have seen on YouTube are spectacular. Mine is a lot more humble - but it is still a very happy space for me and I thought it might actually be helpful to see that you really don't need the biggest space to create a lovely craft haven. Of course there are times when I wish I had a little more space, I am running our of shelf space for stamps, but I will find a solution I am sure. I did do a little bit of a tidy before filming the video but not too much - I wanted it to be as realistic as possible. Click HERE for my video tour. I hope you enjoy seeing my little space. 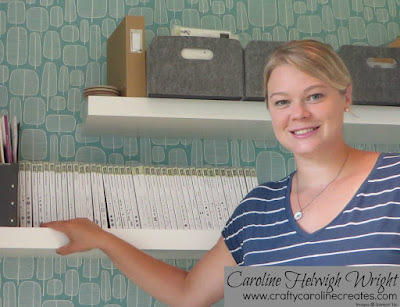 Thank you for showing your craft room; I see so many online that look as they would fit a typical Brish house in them that I tend to feel quite inadequate with my crafing space. I know I'm really lucky I have the box room, however, it does have to double up as a spare room too. Because I have a wooden futon I need to leave space for it when opened up. Watching your video, it dawned on me that I don't have a set of drawers! Lots of DVD racks and a couple of bookcases - I'm a BIG fan of Ikea, but no drawers! How did I not notice before? I'm sure I don't really make the most of the storage either... 250 DVD's use 5 of my racks, leaving the last one to store punches. One 40cm bookcase has my cardstock, I have 4 drawer paper storage boxes from The Range so put 2 colours per drawer. I prefer to keep card covered so it doesn't fade. The other bookcase stores my stamp sets, embossing folders and SU dies. It's the tools, and embellishments I struggle with! One day I might even be brave and photograph it! Thanks for sharing your space Caroline, it is just slightly bigger than mine lol. Like you I used to craft on my kitchen table and when we moved house I managed to have a small space with a table that we bought to go along with our buffet and for me it is a cluttered workable space. You are far more organized than I am but then I like to work in an organized mess being a Gemini. On my table I have an old navy medical box made of solid dark wood basically it is a box full of draws and next to it I have one of those plastic draw units for screws, nut and bolts and that's where my pens, embellishments and other tools go. Behind me I have a mahogany sideboard that was given to me when I left home and some of my papers are stored in there as with my buffet. Unfortunately I don't like Ikea and prefer proper wooden furniture and have just made it work for me. So glad you showed that a little goes a long way! You made much of the space you have and I know you consider it messy...but, well organized! The one spot that isn't...hey we all need a 'junk' drawer or space! Thank you for sharing...I really need to take some notes and pare down what I have. One question...What do you do with all your retired stuff?